We want to get to know all about you so that we may help you! Upon entering our office, our receptionist will welcome you as a member of our family. 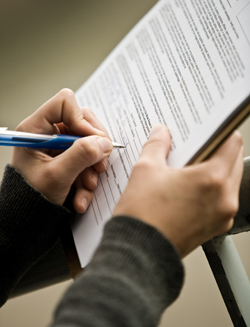 We will request that you complete our patient information forms along with a consent form. This paperwork provides us with some insight to your health history and information on your condition. We’ve also provided our intake forms online, so you can fill them out on your computer and submit them directly to our office! Next, you will have a consultation with Dr. Byrne to discuss your health-related problems. This initial visit is designed for Dr. Dale to learn more about you, your condition and expectations to determine how chiropractic care can meet your goals. After your consultation, Dr. Byrne will perform a chiropractic examination. The exam may contain various forms of neurological, orthopedic, postural, and physical tests to help confirm a diagnosis and determine the best possible treatment plan to resolve the problems at hand. Depending on your specific condition, it may be necessary to refer out for X-rays. X-rays help us develop the most effective treatment plan for you, and alert us of any serious spinal conditions. Most people are amazed once they see their X-rays up close and in some cases, they can even identify their misalignments and degeneration themselves. After reviewing your health history, goals, consultation notes and exam findings as well as any radiological reports, we’ll discuss your options for treatment as well as the possibility of involvement with other providers. Dr. Byrne will provide the best treatment and wellness program for your needs. At the conclusion of this initial appointment, most have the ability to experience your first treatment. This may include spinal adjustments, soft tissue therapy, and/or therapy modalities. Treatment is interactive, so you can ask any questions you have about the different styles of treatment or options available to you at anytime. From start to finish your initial visit will last approximately 40-60 minutes. At the completion our friendly staff will be glad to assist you with any questions regarding billing including the assistance of billing to your insurance company. We are able to direct bill to Alberta Blue Cross, Great West Life, Sunlife Financial, Desjardins and Green Shield Canada. For any other insurance company we can provide you with receipts to ensure you are reimbursed properly. We will also be glad to find you a time to fit your schedule for a follow up visit. Click here to see Dr. Dale Byrne office hours.